It’s only taken 35 years, but Farge and Foucault’s Disorderly Families has finally appeared in English. Looking forward to seeing a copy soon. 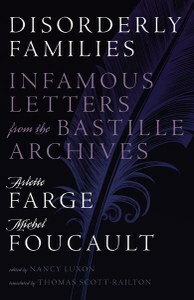 First published in French in 1982, this first English translation of Disorderly Families contains ninety-four letters collected by Arlette Farge and Michel Foucault from ordinary families who submitted complaints to the king of France in the eighteenth century to intervene and resolve their family disputes. Together, these letters offer unusual insight into the infamies of daily life.